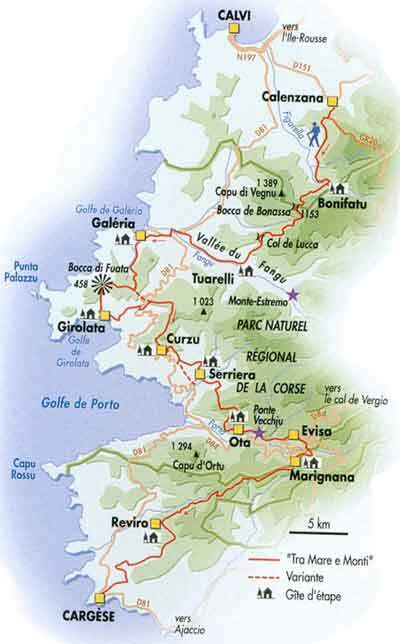 For all details of our walking and hiking trips in Corsica surf on the links below. Corsica is a mountain in the Sea. 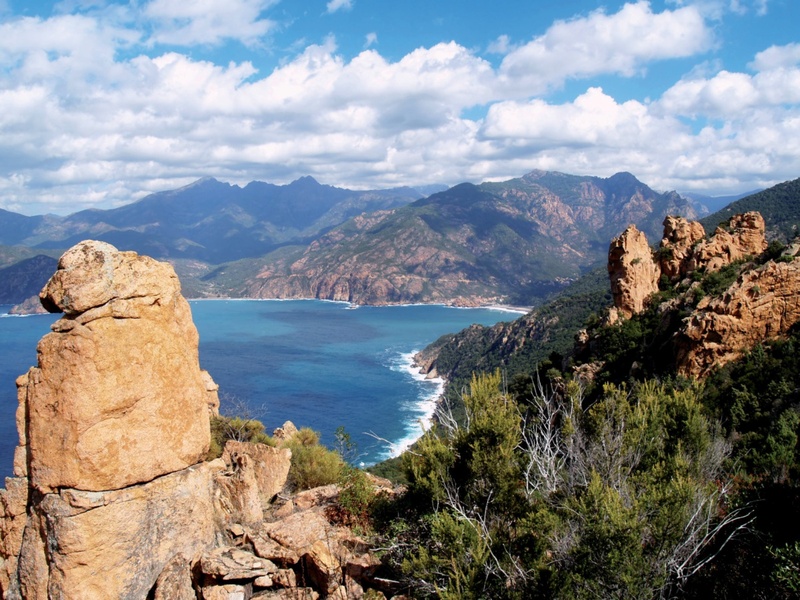 There are four classic walks in Corsica that snake around the foot of the massifs and lead through forests and villages offering breath-taking views over the mountain tops and out to sea. In all of them you will pass through a series of villages as well as the stunning landscapes that are a joy to discover . The Mare a Mare South is a distinct favorite. The lightest walk of all. Starting from the gulf of Porto Vecchio on the East coast, the trail rises up through the mountains of the Alta Rocca region to arrive in Propriano on the West coast. This holiday would appeal to anyone that is used to walking regularly and is in good shape. With five days of easy to moderate walking you will discover the richness of the extreme south. The Mare e Monti North lets you enjoy all the contrasts and colours of the island. It is one of the five classic walks in Corsica that snakes around the foot of the massifs, which leads through some lovely forests and villages. Setting off from the Balagne you will head inland towards the high summits, enticing views of sweeping bays, rocky creeks and glistening waters are forever present. This holiday would appeal to anyone that is used to walking regularly and is in good shape. With eleven days of easy to moderate walking you will discover the richness of Corsica and one of the most beautiful corners of the island. Numerous pleasures are waiting to be discovered, from the high airy mountain peaks of Bonifatu, the trail leads past the reserve of Scandola an area protected by Unesco and classed as a site of world beauty. In the Gulf of Porto you stay in the unique little fishing village of Girolata which is accessible only by boat or foot. The MEM north is available as a 13 days or as a 9 days trip, the 9 days trip available with dormitories or with standard ** chambres d'h�tes (one stay excepted). The 13 days walk has more dormitories included. Bus from Ajaccio, via Propiano (10H15) to Porto Vecchio. Bus ‘Eurocorse voyage’ tel: 04 95 21 06 30 Price: 26 euros p.p. Departure from Ajaccio to Porto Vecchio from 16/09 to 30/06 at 8h30 or 16h00 except Sunday and bank holidays. From 1/07 to 15/09 at 8h00 or 15h00 during the week and 8h30 or 16h00 Sunday and bank holidays. The journey takes 3h30. Bus Eurocorse Voyage tel: 04 95 21 06 30 Price: 13 euros app. Depart from Propriano to Ajaccio from 16/09 to 30/06 : 8h10 or 16h15 except Sunday and bank holidays. From 1/07 to 15/09 at 8h10 / 9h55 / 15h45 / 16h15 during the week and 10h00 or 16h10 Sundays and bank holiday. Bus Autocars Ricci tel: 04 95 51 08 19 Price: 12 euros app. These walking tours have a variety of accommodations: hotels, chambres d'h�tes and g�tes with dormitories. See the description of the different tours for the details. In hotels you'll have bathroom en suite (budget and standard package). In chambres d'hotes you'll have private rooms and sometimes bathroom en suite (standard package). In g�tes you will sleep in dormitories (4 - 7 beds), so sometimes together with other walkers (budget package). June and September are the best months to walk on Corsica.